Arriving passengers must count an average of 30 to 40 minutes to complete the formalities of police and customs and to retrieve their luggage. 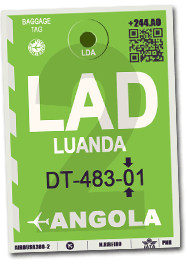 Entry into Angolan territory through Luanda International Airport requires a passport valid more than 9 months after the passage of the police station. The exemption or the method of obtaining the visa depends on the nationality of the traveler. You can either be exempted or have to obtain your visa in an embassy/consulate. WARNING: Bi-national travelers who can not justify their Angolan nationality (identity card or Angolan passport) are subjected to the same formalities as the citizens of the country of which they hold the passport. Pets with a recent health certificate are allowed in Angola. Rabies vaccination must be at least 1 month and max. 1 year prior to arrival. The yellow fever vaccine is required to enter Angolan territory. In addition, travelers coming from countries affected by various other epidemics (eg Ebola ...) can be imposed special formalities: declarative form, taking of body temperature ... Pregnant women are reminded that airlines each have a specific policy on the duration of pregnancy not to exceed to be allowed to travel. From the 7th month of pregnancy, flying may be prohibited or a medical certificate may be required. Please check with your airline to avoid being denied boarding. Some products can not cross borders on arrival or departure from Luanda Airport without special authorization. This is the case of animal remains, live animals and certain items of historical heritage of Angola. Thank you to contact the Veterinary Services or the Ministry of Culture if you have any doubt about this type of product. Hazardous products (firearms, explosives, corrosives, pressurized container, etc.) are generally prohibited or regulated. Thank you to contact your airline to find out its policy on the transportation of these products.